So it’s been a full week now in Aix but it feels like it’s been so much longer. What’s so great about being here is developing a new normal. Anyone that knows me well knows how horrible I am with directions but since it’s finally sunk in, I can now get my way around Aix and develop some regular habits. For example, today we had a nice lazy morning. I slept in and left the house near 11:45. It’s a brisk walk to head into town; it’s a good 15-20 minutes if you keep an easy pace, which I do in the mornings considering it’s up tight sidewalks up a hill. (It’s 30-35 to go to school at a fast pace, so we’ll just see how that one goes…) We went to a beautiful outdoor market in the heart of Centre-Ville, where I bought some fresh peaches. I stopped at a boulangérie and bought some pastries (that may or may not have contained chocolate) and we then had pick nick in the park. It finally hit me that I will now live in France. It keeps dawning on me in waves that it’s now real. I’ve been a little melancholy about giving up the traditional college campus experience but eating fresh pastries with the sun on my skin and the cobbled road under my feet and realizing that I have so much more open to me has really cleared up that problem. It’s been like a dream without any classes to worry about yet but I know that even when those start, it’s still not anywhere near as stressful as it would be back in school. We then went back to where the market was this morning but the space had since been reclaimed by café tables. We sat there for what seemed like forever in a minute while playing cards and listening to street performers. I could’ve spent hours and hours there, just doing what the Aixois do; enjoying an afternoon of people-watching and living easy. After that, we discovered some new little rues and window-shopped. 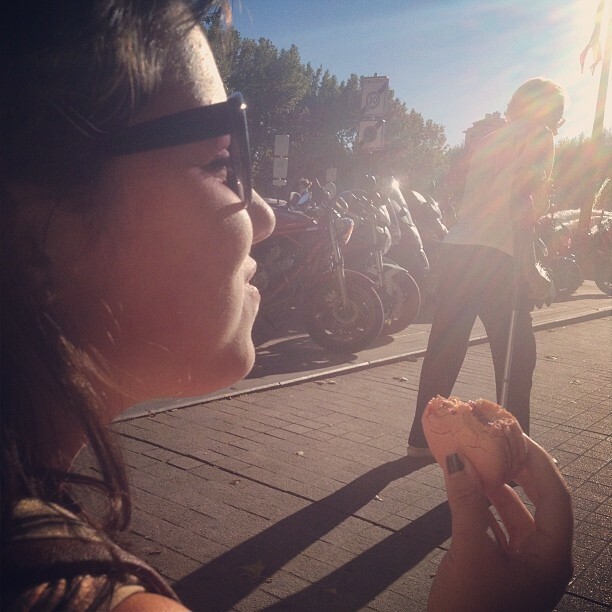 I had my first taste of macaroons, which I liked but I’d much prefer “la glace” or “une tarte aux pommes”. I got to know my room mate much better as we sat beneath a statue and watched the people go around the Fountaine. We then walked back only to then enjoy dinner with Madame de Vergnette and her fiancé Gil. She’s a very chic 60+ woman and it was just about the cutest thing watching them together. I knew she was a widow but I didn’t know she was engaged, so I was just smiling all throughout dinner seeing her so happy. Tomorrow I’ll find out which level I’m in and hopefully meet some great people.